Here’s my five decorating tips for making stress-free Christmas Cookies. I woke up this morning, ready to mail a Christmas present to a friend. I found the box for the present. I found the shipping box. Ah! There’s room on the side of the shipping box. Just the right space for a package of cookies. I had just bought a cool canister of sprinkles from Aldi’s. I’ll make iced sugar cookies. This would be a good time to make Great-Grandma Flossy’s Drop Sugar Cookies. I haven’t made those in years. I could ice them and decorate them and . . .
What am I thinking? I hate icing cookies! I don’t do it very well. I’ve got other things to do. Why not? My husband’s taking a vacation day today and I should too. Here we go. As I iced my cookies, I learned a few things that probably apply to anytime I need to do something new. Here’s my decorating tips for frosting Christmas cookies. Learn as you go. I haven’t iced sugar cookies in years. I fret over cake frosting. Christmas sugar cookies, like fudge and other holiday specialties, are one of those thing we don’t do often enough to remember what we did the last time. At first, my frosting was too thick. My husband thought I wasn’t putting on enough frosting. The goo of icing running over the sides made him realize why I was being chintzy. Then I thinned the icing too much. The icing dried before Jack could apply the sprinkles. I was icing cookies too quickly for him to keep up. If he and I had been tense about every cookie being perfect, we would have ended the cookie icing session with a marital spat and un-iced cookies. Instead, we relaxed and talked through how to make each cookie better. Enjoy the moment. I mean, someone has to destroy the evidence of burnt and broken cookies, and drippy icing. I should have painted Jack’s nose with icing. I could have added red sprinkles and called him Rudolf! Give yourself a second chance. 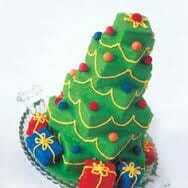 As I mentioned, I fret over frosting. My recipe was that of my great-grandma Flossy, a soft sugar cookie that I remember loving as a child but the one time I made them as an adult, they were horrible. My girls found the recipe in my file and wondered why I had kept it. I don’t know what compelled me to try them this morning or to put icing on them. I’m the one who chafes at icing anything. But I’m glad I did. It wasn’t that hard and we had fun. Maybe I have matured and learned to relax over the years. I’m the one that has changed. It’s refreshing to try things again that were difficult or scary in a younger season of life. Risk it! I made the cookies this morning to ship to a friend in Ohio. What was I thinking? An old recipe, icing I don’t feel competent to apply, and shipping iced cookies that might get stale, broken and smooshed in the shipping process. Why not? It’s Christmas. I love my friend. I love baking. I love spending time with my husband. Aren’t those things more important than perfect cookies? It’s time for me to observe the advice I gave my daughters countless times: the process is more important than the product. Here’s Great-Grandma Flossy’s recipe for Drop Sugar Cookies. You can figure out your own icing. Blend together margarine ( used butter), salt, lemon rind (I used a ½ tsp lemon juice instead), and nutmeg. Cream in sugar, add eggs and beat well. Stir in milk. Stir together dry ingredients and stir into creamed mixture. Drop rounded teaspoonfuls on greased cookie sheet. Bake at 375 degrees for 10 minutes. Baking Christmas cookies can be an act of worship. Turn Christmas cookie baking into a time of worship. Ho boy. Back up Karen, big time. Start from the beginning. WHERE did you come up with that? Okay, follow me on this. At the heart of it, Christmas is about honoring the coming of Jesus Christ into the world. Right? Next. What counts to God is not WHETHER we celebrate Christmas but how and why we celebrate it. The world has messed up the meaning of Christmas so much, it’s easy to get discouraged with the whole thing and throw the baby out with the stagnant water in the stable yard’s horse trough. I’ve heard a number of people this year question whether Christians should celebrate Christmas. Isn’t it just a pagan holiday? The Bible doesn’t command us to celebrate the birth of Christ, so should we? Like so much in life, Christmas in and of itself is a good thing. Within the context of God’s plan for the world it is a beautiful thing; without that context, it is meaningless and empty. 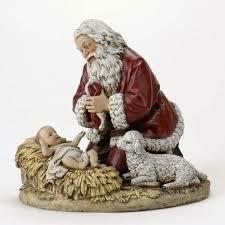 The angels, shepherds and Wise Men got absolutely dippy about the birth of that baby, so why shouldn’t we? The birth of any baby is an exciting event. Ask any mom. She can still tell you infinite details about the pregnancy and birth of each child. Not only does the Bible devote four and a half solid chapter to birth details in the New Testament; dozens of verses in the Old Testament alert the reader to watch for further updates about a coming Child who will save the world from their sin. Yes, to God, the birth of His Son is a big deal, an event future generations would do well to remember. Agreed. However, I think many Christians struggle over their choice of Christmas activities. They are frustrated by the emphasis on the methods of celebration rather than the reason for the celebration. Is all the fluffy stuff the world calls Christmas celebration really necessary? If I’m going to celebrate Christmas God’s way, does that mean I should spend my time in quiet meditation and church services? Karlene Jacobsen, in her story, ‘’The Quilt” which appears in our Anthology, Christmas Treasures, had one of her characters says this, “It matters little when, but how we remember the greatest gift ever given.” So how should we remember the greatest Gift ever given? WHATEVER you do, that’s what it says! As long as we include God in the process, as long as we invite Him to the dance in our hearts, I truly believe He doesn’t care how we celebrate. The important thing is that we honor Him in what we do, we use the outward props as tools to our worship, not ends unto themselves, we don’t succumb to greed or legalism, and we remember the poor. Here is my struggle. How can I avoid the legalism and expectations of Christmas? How can I possibly honor Jesus by putting up decorations that I consider a chore? On the flip side, how can I avoid thinking about myself when I really do deep down enjoy making cookies? 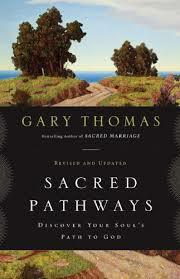 Sacred Pathways is on my wish list for Christmas! God made each of us to be uniquely ourselves. We have our own package of worship styles, learning styles and spiritual gifts. (For more on worship styles, check out the book, Sacred Pathways by Gary Thomas.) God expects us to worship Him using what He has given us. Isn’t that exciting? Don’t you feel set free? I am praising God when I cultivate the gifts He gave to me. I worship best when I express myself creatively using what He has given to me and do it in His honor. Decorating a house may not be my thing, but it is to someone else. They are using their gifts and praising God just by lavishing lights, ribbons, and ornaments over every square inch. Go for it! My gift is enjoying your creativity and praising God for how those decorations remind me of His greatest gift. When I sing a Christmas carol, I hope you’ll find encouragement and joy in the beauty of the music and a reminder of God’s great deeds through the words I sing. After all, any kind of praise to God is a sweet smelling sacrifice to Him. What are other reasons Christians should celebrate Christmas? Share your thoughts! Every Christmas celebration can be an act of worship. Grandma’s Christmas cookies are the best! When reminiscing about by-gone holiday seasons, it doesn’t take long before someone brings up cookies, especially the kind Grandma made. Every family has a favorite cookie recipe that, though dog eared and flour stained, has survived the handing-down from generation to generation. They just don’t make cookies like they used to! I browse through Pinterest and there are all kinds of ooey-gooey bars and heavily iced cut-outs. Sometimes my mouth waters for the simple goodness of a Snickerdoodle, Molasses Crinkle, or my Great-Grandma’s soft sugar cookies. For Donna Scofield, author of the story, “Mary Ann’s Gift” which appears in our anthology, Christmas Treasures: A Collection of Short Stories, their family recipe was a honey bar. Plain Mary Ann, reads Donna’a story blurb, knows widower Henry chose her as his wife because he needs a mother for his children. What she couldn’t guess was how much love and happiness would be found in their first Christmas together. Turn oven to 350. Butter a 9 inch square baking pan. Beat butter and sugar together. Beat in the eggs, honey and vanilla. Mix the flour, salt, soda and cinnamon together and add to the eggs, honey and vanilla. Add chopped nuts. (Mary Ann would have used black walnuts, but they’re hard to find and expensive now. Walnuts or pecans serve nicely.) Spread the batter into the pan and bake for 25 to 30 minutes, until the edges begin to shrink and a straw inserted in the middle comes out clean. 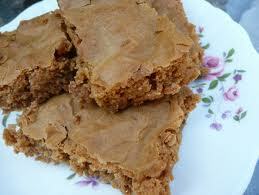 Let the bars cool in the pan, then cut them into little squares. The best part of Christmas cookies, I think, is that they are always something that is shared. It’s no fun to eat cookies alone – even when you’re sneaking one out of the cookie jar at two in the morning!. Grandmas are always supposed to have a jar filled with fresh cookies for the grandkids. When planning women’s events at church, cookie exchanges (don’t forget the recipe) are often at the top of the idea list. We package up the leftovers for the shut-ins, we send care packages to the college students and military, we take a plate (or a basket) over to the public school teacher’s lounge. 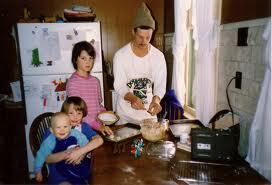 My mom used to bake and ship cookies to the college grandkids. Now we mail cookies to her. One of my favorite projects lately is to bake cookies to leave at the Christian Students for Christ Campus House at my local university where many international students live. There is so much wrapped up in a simple cookie. Cookies represent home, belonging, sharing, good conversation. Don’t forget – must leave cookies and milk for Santa’s helper on Christmas Eve. Who can you bless this holiday season with a plate of Christmas cookies? Donna Scofield has had a novella published by Harlequin/Silhouette, short stories published in women’s magazines, and was fourth place winner in the national short story contest held by Country Woman. She has self-published two books, The Family Chuckle and Back Home, historical fiction. Lighthouse of the Carolinas is preparing to publish her most recent book, That First Montana Year, for publication in August, 2015. 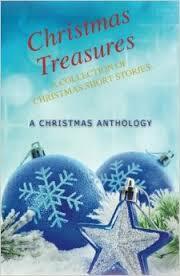 The twelve authors of Christmas Treasures would love to share all their stories with you. We’ve had such a wonderful response all ready. Several people, after reading the Kindle version have said they intend to buy the print version for Christmas presents. We agree and hope you can too!